Acanthus is a genus of perennial sub-shrubs that are grown for their ornamental foliage and flowers. They are quite showy plants and can be recognized easily in a landscape for their glossy-green leaves. Originally native to the Mediterranean region, Acanthus has inspired several architectural designs and patterns in the Greek and Roman culture. One can easily recognize and relate several architectural motifs in ancient Roman culture with beautiful foliage of Acanthus. In fact, Roman and Greeks revered this plant and used it as a decorative plant. Flowers on Acanthus plants are borne along long stalks (up to 2 meters) that stand out in plantation. Flowers are usually white or cream with a hint of purple. Acanthus is easy to grow and maintain. These ornamental perennials are grown best under share or filtered sunlight. Young plants requite regular watering, however, once establish they do not require much attention. Most species of Acanthus have long tap roots making it difficult to root them out. Since these plants are quiet showy and noticeable in size, it is recommended that you do not grow them near low growing plants. Acanthus is best grown as border plants or as background foliage plants in a landscape. These shrubby plants can be propagated from cuttings. 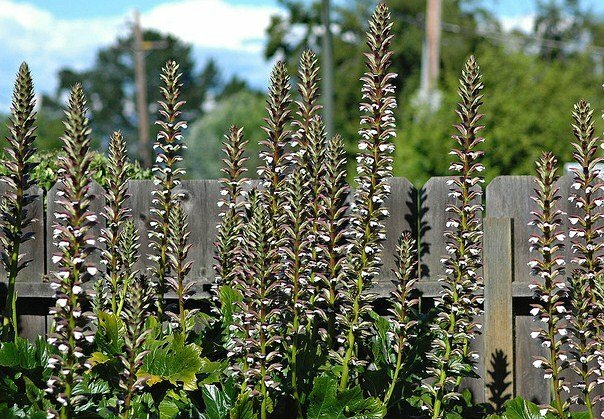 Among all species, the most cultivated is Acanthus mollis, which is also known as Bear’s Breeches. Other popular species are: Acanthus spinosus and Acanthus hungaricus. Acanthus spinousu is recipient of Award of Garden Merit by The Royal Horticultural Society.